Landscaping is important during the spring, when April showers may bring more than May flowers. Intentional landscaping, large or small, can be used to prevent drainage issues. You may have noticed places in your yard that have a drainage problem. Kohler Outdoor can help! Take a walk around your property and look for problematic signs including migrating mulch, standing water, evidence of excessive runoff, or downspouts that overflow or dump. Landscaping, installed intentionally, can correct these issues. Kohler Outdoor installs underground drainage systems like French drains and above ground drainage systems like dry creek beds to help with drainage issues. If you don’t have good drainage on your landscape, chances are, your outdoor living space isn’t going to be a success. There’s one factor that will decide if you have drainage issues: having something that hinders water from moving downhill. It’s really that simple. 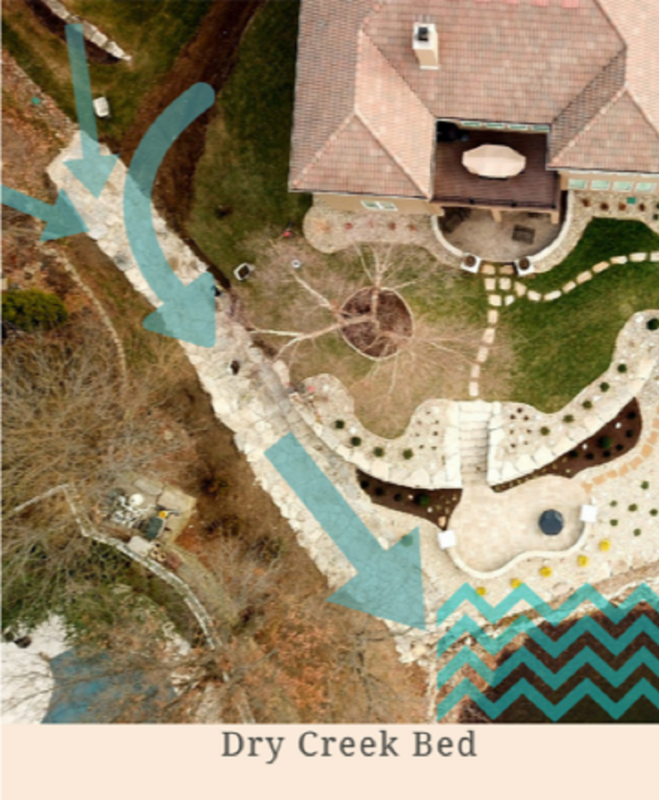 Drainage plans are a vital part of any landscaping design. It could consist of an elaborate plan with a catch basin, large and small diameter pipe, sump pump, French drain, gravel and head walls. Or, it could be as small as just thinking about what happens on your terrace when you water a new container plant. A creek bed like can channel water away from a low spot or direct runoff into a rain garden or dry well. With the right landscaping by Kohler Outdoor, the creek bed will look good even when it’s dry as part of your landscaping. This dry stream bed looks so natural, you’d think it had always been part of the landscape. Watch drainage woes disappear when you make this water-diverting, eye-catching feature in your yard. A French drain is a versatile system for dealing with all kinds of drainage problems. It disperses water over a large area through a buried perforated pipe. The pipe must be surrounded by material that allows water to drain through. A properly designed French drain system does not require an outlet. The water will simply soak into the soil as it flows along the perforated pipe. In fact, a French drain doesn’t require an inlet on just one end either. Kohler Outdoor can construct the drain to accept water along its length and disperse it underground. Kohler Outdoor can help with all your landscaping drainage issues. They also provide many services like pavers & flagstone, turf treatment, and more. Call Kohler Outdoor at (816) 540-4400 for more information.